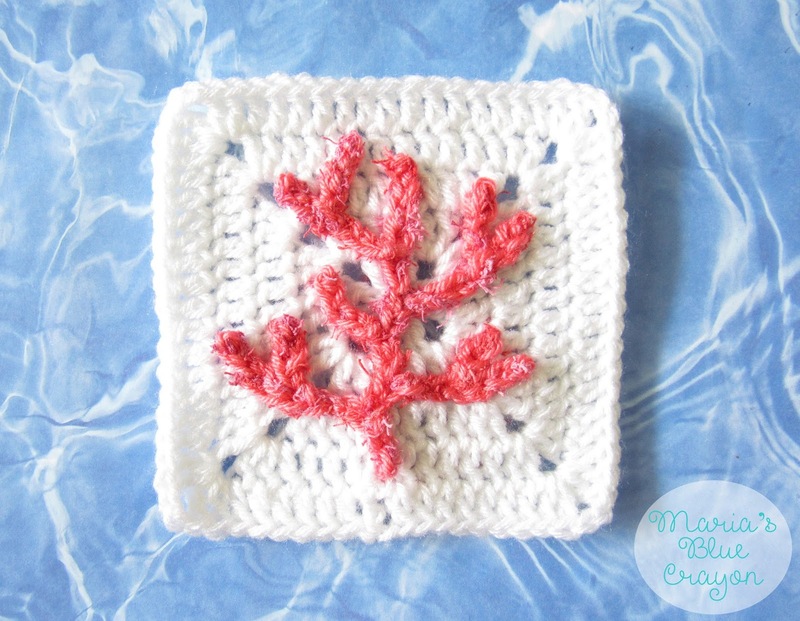 GET THE CROCHET CORAL APPLIQUE ALONG WITH THE GRANNY SQUARE PATTERN IN AN AD-FREE DOWNLOAD HERE. OR SCROLL DOWN FOR THE FREE CORAL CROCHET PATTERN. This granny square makes the 5th design of my Ocean themed Afghan. For all the information for the Ocean Afghan click here. You can’t have ocean theme without coral, and I have the perfect pattern for it! I used Red Heart’s scrubby yarn to give it some texture and depth. I paired it with a regular worsted weighted yarn so it would be easier to work with. The result is a subtle texture and so coral-ly! (Sorry, I know that’s not a real term). The shades of pink work nicely together and believe it or not, the scrubby texture is soft! You can even check out my scrubby pattern here to use up all the left over you will have from this project. You will only need a few yards. I attempted to write up the pattern, but it was too wordy and complicated. This coral is literally only made up of chains in which I branched out in different directions. To make things easier (and hopefully not more complicated) I made a chart. I know charts can be intimidating, but I have done my best to add explanations as well! Note: There will be a lot of ends. I tried to weave them in as I went along. 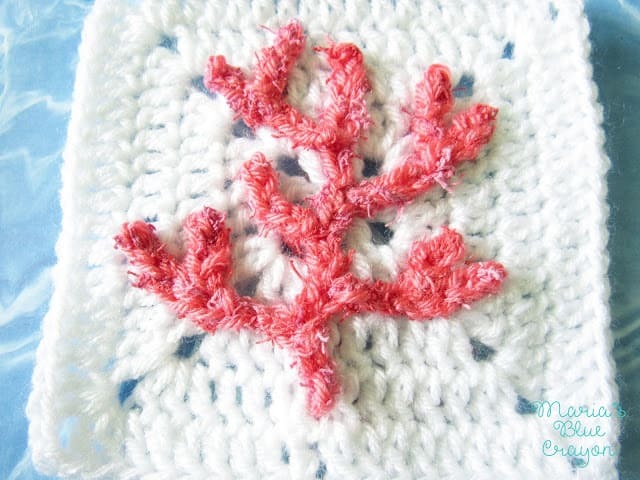 I sewed the coral to the square at the end with a separate piece of the pink worsted weighted yarn. Throughout the pattern, the worsted weight and scrubby cotton is held together and crocheted as one. If you do not want to use the scrubby yarn, you can just double up the worsted weight yarn. I have added numbers to this chart. I know it is probably not conventional to do so on a crochet chart, but counting small dots can be a headache and I don’t want this to be an unpleasant experience for you. First and most importantly, all those dots represent chains. That’s all this pattern is. Chains. It’s just a matter of how many and where. Start with chaining 15 holding both the scrubby and worsted weight yarn together. I added red to these dots because this is the main part of the coral. 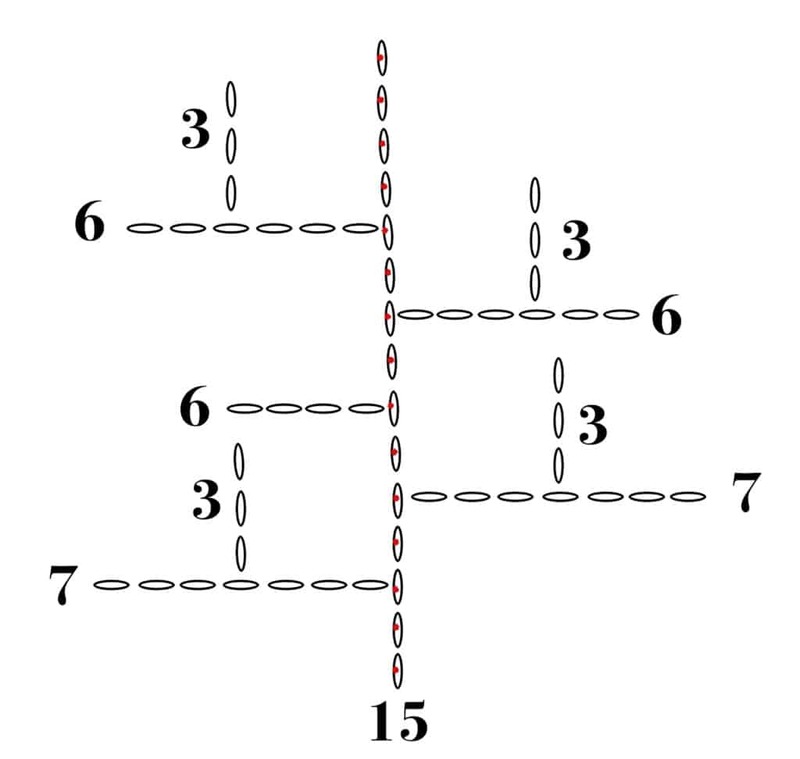 This is the chain we will be working off of. Once you have chained 15, fasten off. From here, I branched off starting at the bottom. On the left side I attached the yarns 3 spaces up from the bottom, chained 7, and fastened off. Again, I attached the yarns to the middle of that chain 7, chained up 3 and fastened off. That creates the bottom left branch. I continued to do these branches stemming from the main chain on both sides as shown in the chart. You will end up with what looks like a chained mess so you will have to form the coral’s shape before sewing it onto your square. Pinning it down before you sew it on will help tremendously. Love it! It looks so realistic!